Slice cabbage, chop kale in very small bite size pieces, place in bowl and set aside. Slice avocado and then slice again the opposite way creating a dice. Chop almonds and dates. Slice grapefruit and remove each section. Once all of this is done I like to arrange the salad so I can see all the ingredients on top (hey we eat with our eyes first). Then, if using parm, add that and top with dressing, I lot to spoon it over top and serve it with extra on the side. This salad goes great with any protein you prefer and is also delicious with a grain like quinoa or buckwheat. Combine all ingredients in a shaker. Shake until thoroughly combined. Enjoy! I literally cannot get enough of this salad. I had something similar to it a few years ago at one of my favorite healthy restaurants. I loved it, but had a feeling with a few tweaks I could make it even better, and I did, A LOT better. I crave this salad so much in the summer, it is so fresh but really packs a flavorful punch! The dressing is very light, and it is not creamy unless you add the Dijon. 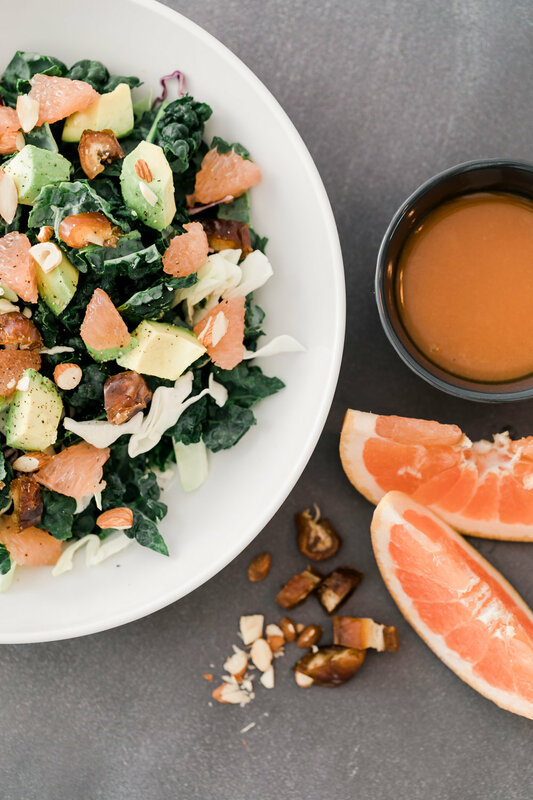 If you prefer your kale a little on the softer side, add the dressing directly to the kale and massage it (yes literally massage it with your hands) and then add toppings to the kale and serve with extra dressing on the side.